Home > Mobiles and Your Health > How Much Time Should You Spend on a Mobile? Although potentially a harmful problem, mobile phone dependency is still largely unrecognised by users - so how can you tell if your mobile use is normal or out of hand? Would you be able to switch off your mobile phone, put it in a drawer and forget about, even just for a day? If you’re honest and say no, then be reassured you’re not alone; a recent survey found that of the people quizzed, 45% said they couldn’t either. 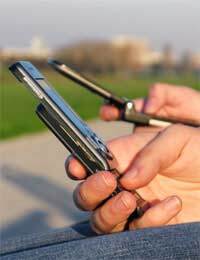 This intense need to be in constant communication with others, to always know what’s going on, is one of the root causes of mobile phone addiction. For those suffering from an abnormal dependency to their mobile phone, the idea of being out of the social loop by having their mobile locked away would be enough to induce so much anxiety that they wouldn’t be able to relax and enjoy themselves. Although mobile phones are designed to make the modern world more convenient and well organised, for many they are disrupting the lives of users who can’t bear to switch them off. In the survey a disturbing 7% of users said their mobile use had resulted in them losing a relationship or a job. But how can we tell if we are one of those people whose mobile phones are having more of a detrimental than beneficial effect on their lives? Unlike addictions to drugs or alcohol, it can be difficult to tell whether somebody has a problem because using a mobile phone regularly throughout the day is seen as normal. There is no defined ‘healthy’ limit of daily mobile use because some users, whether because of their job or through living away from family and friends, may use their phone for a few hours a day but not necessarily be compulsive users. What is more telling is with what ease a mobile user can leave their phone alone. If you find yourself pulling out your device and messing with it without good reason, or at times and in situations where it is inappropriate, then perhaps it is time to step back. If you find you can’t make it through a dinner or a meeting without checking or sending a text message, or that you obsessively check your phone for new voicemail or text messages, then you displaying classic signs of mobile dependency. Two Spanish kids defined serious mobile phone psychological dependency in a recent, widely-reported news story. The 12 and 13-year-old children were talking, texting and playing games on their mobile phones to such a degree that they struggled to lead normal lives, failing at school and deceiving relatives in efforts to obtain money for phone cards. With half their waking hours spend glued to their mobiles, their parents were concerned enough to send them to mental health clinic to receive specific treatment on their perceived mobile phone addictions. Although many mobile phone users – particularly young people - exhibit symptoms and patterns of behaviour that are more commonly associated with gambling addicts – such as using something to feel good, building up a tolerance over time and suffering from withdrawal if deprived of it – studies have yet to ascertain whether such excessive phone can be considered actual addiction. Nevertheless, what is agreed by experts is that mobile phone use can be harmful if left unchecked. If you are unconvinced that you are psychologically dependent on your mobile phone then why not try locking it away for a couple of days and see how it affects your behaviour. Do you find you are you more irritable, does your mood suffer? If you are already worried about how much you use your phone then try to get used to a pattern of taking a break from it. Switch it off at night before you go to bed, and leave it behind when you go on holiday, for instance. You may find that you start to enjoy the feeling being out of the loop and unavailable. That is one of the key aspects to holidays after all.